The CIA could have given a bit more justification to make its case. The National Archives and Records Administration formally approved a CIA records retention schedule that allows the agency to destroy information that is more than 30 years old – in spite of the warnings from public interest groups and others arguing that permitting the spy agency to delete the records will likely result in the destruction of a large number of potentially important documents. But the records schedule – and NARA’s apparent rubber-stamp approval of it – is doubly concerning considering the agency’s own history of destroying important records. Malcolm Byrne, the Archive’s Iran Project Director, pointed to recent reports that the Agency destroyed records on its involvement in the 1953 coup when it moved offices on the incorrect belief that there were copies of the records elsewhere. Byrne argued in July 2017 that, if “CIA disinterest in some quarters about preserving records, human fallibility, and similar horror stories are a guide, then logic dictates there are plenty of grounds for concern – or at a minimum meaningful oversight, which is always a concern in these days of slashed budgets.” The CIA also “mistakenly” destroyed its copy of the 6,700-page Senate Intelligence Committee report on the agency’s torture program, and destroyed 92 video recordings of Abu Zubaydah being waterboarded 83 times in one month in a black prison site back in 2005. The Bureau of Land Management is attempting to simultaneously limit the number of FOIA requests a person or organization can submit and increase the costs of filing a request with the agency so it “can recover all of its direct costs.” The suggestion – which first appeared in a September 27 report – is misleading on a number of levels. It implies that BLM is receiving more FOIA requests than it can handle or has previously processed, but BLM only received 862 FOIA requests in FY2016, well within a normal range for the agency. It also implies that BLM would see any of the money the agency collects from FOIA fees, which it doesn’t now and wouldn’t in the future, because FOIA fees go to the U.S. Treasury’s General Fund, not to cover agency FOIA costs. It’s also worth noting that, thanks to updates to the 2016 FOIA Improvement Act, if an agency misses its 20-day deadline to respond to a request, it cannot, in most situations, collect fees anyway. Attempting to limit the number of request a person or organization can file is not a new suggestion – it has even been promoted by some members of the open government community – but it’s not the right track to take. The single best way for agencies to get in front of a growing number of FOIA requests is posting more records proactively, and the easiest way to cut down on processing times and save resources is to embrace a presumption of openness and let more documents go with fewer time-consuming and unnecessary reviews. FOIA requests from the Environmental Integrity Project show how much EPA head Scott Pruitt spent on travel – and that much of it was spent on travelling first class, a habit his predecessors largely eschewed. Specifically, FOIA-released documents show that “the taxpayer-funded travel for Pruitt and his top aides during that stretch in early June cost at least $90,000… That figure does not account for the costs of Pruitt’s round-the-clock security detail, which have not been disclosed.” Pruitt also “brings a larger entourage of political advisers” and the “overseas trips are largely untethered to the kind of multilateral environmental summits that dominated his predecessors’ schedules, and Pruitt rarely discloses where he plans to be.” Pruitt cites security concerns as a reason for not releasing more information in advance about his schedule. George Washington University’s Program on Extremism has – with the help of a series of FOIA requests – just released an 87- page report that is “the most comprehensive ISIS study ever compiled in an academic setting.” The document, “The Travelers: American Jihadists in Syria and Iraq,” found that “Sixty-four American citizens have traveled to Iraq and Syria since 2011 to join terrorist groups,” that these extremists do not fit a single demographic, but that most were considered “networked travelers” – meaning that they had personal connections to the jihadist group they joined. A partially-declassified CIA history of the 1953 coup in Iran, released in late 2017, includes an-depth critique of how the agency approached the operation, highlighting the effects of bureaucracy and politics on the conduct of U.S. clandestine activities. The CIA report, recently posted by the Archive, also reveals details about the hatching of the covert plot as well as its execution. The posting includes side-by-side examples to illustrate some of the differences in releases over the years. This week’s #TBT pick is chosen with the further release of “Zendebad, Shah!” in mind and is a 2013 posting on the CIA’s first official confirmation of its role in the 1953 coup. The explicit reference to the CIA’s role appears in a copy of an internal history, The Battle for Iran, dating from the mid-1970s. 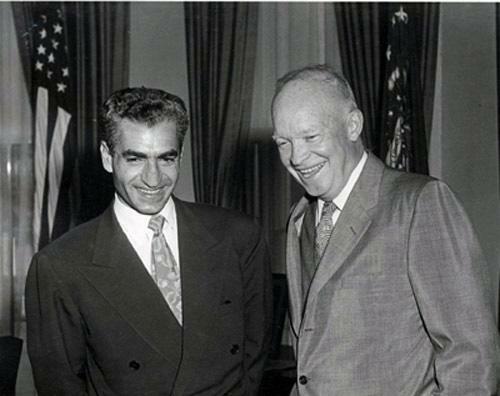 More information on the National Security Archive’s Iran-U.S. Relations project can be found here.